I come with new experience today, I will give how to make Super Hidden files to be unhidden. According to the previous post Viewing Super Hidden Files. Many virus especially from Indonesia, are hiding our files with Super Hidden attribute activated(System files). How to change the attribute. If previous post is just viewing them, this time will unhide them so can be viewed at other computer without any setting. For example, we have a file which is super hidden. How to see if a file is super hidden, see the properties of the file and see if hidden option cannot be changed. There is 2 ways, that is hard way and easy way. Maybe you will choose the easy way. But I will give the hard way too. You can learn basic of CMD from PcStats - Beginners Guides: Windows XP Command Prompt. "Start-> All program -> Accesories -> Command Prompt"
"Start -> Run -> type 'cmd' -> OK". 2. Go to the folder where your data that you want to change the attribute. 3. Type "attrib" to check the file that super hidden ~EDIT:to Check files attributes~. Type "dir /x" to view your special filenames at CMD, so CMD can understand & find it. 4. Type "attrib [+attibutes -attributes] [filename]"
Filename: is not the long filename but the one that viewed at "dir /x" command and not viewed at "dir" command. Example: If you have a file named "Games Cheats.txt" that is super hidden. Then you must command "dir /x", it will say "Gamesc~1.txt". Then if you want to change the attribute to unhide it type "attrib -s -h Gamesc~1.txt". Then check it again with Win Explorer or CMD with "Attrib", it should no "S" and "H" attributes. You can also use "attrib *.exe" to process only files with ".exe" filetype. Asterisk or usually called wild card "*" is used to manipulate a command to process/effect all variable in the place we place it. The easy way is using free program and you should will not having any problem like at Hard Way, because it is not using a command but clicks! 3. You may be don't know how to start it. You must Right-click at files/folders, "Change Attributes..."
4. If you want to unhide it from super hidden unselect "Hidden" and "System" options, and if you want to make it super hidden just select those! Easy isn't, this is a FREEWARE that I found. It also can change the time stamp. I am gonna making a new blog the same just like this, but with Indonesia Language. And I have a problem that I cannot do it alone. And of course I will make a free short url forwarding from uni.cc. Just like for this blog which computerxp.uni.cc. And for Indonesian Blog I will use computerxpid.uni.cc. What do you think? Do you like this(computerxpid.uni.cc) URL? In every computer and every storage there are files that are being hidden. 1. Normal Hidden, also known as hidden. 2. Super Hidden, also known are System Files. And many virus are hiding our files and change his name to our filenames, so we can get a wrong click that will activate the virus. And what will I give now is, how to enable viewing hidden files and super hidden files. a. Go to Start, Control Panel, Switch to Classic View, Folder Options. b. Open windows explorer or a folder, Tools, Folder Options. 3. In "Advanced Settings" choose "Hidden files and folders -> Show hidden files and folders". 4. Uncheck "Hide protected operating system files (Recommended)". Note: viewing Super hidden files is very dangerous don't use it if you do not understand about Operating System files!!! No Warranty to do this!! "Google is having too much money too spent. Now Google will spent $30 Million for anyone that can send a robotic spacecraft to the moon and BONUS $5 Million if the spacecraft is the traveled furthest distance, finding water or ice, best endurance to the cold lunar nights, etc. So, if you can, just go for it. And don't forget this blog. The deadline for this challenge is year 2012." Google recently announced plans to offer up to $30 million to the first private organization that is able to safely land a robotic spacecraft on the Earth's moon. Working alongside the X Prize Foundation -- a foundation known for offering challenges for monetary reward -- the contest will be open to any "nongovernmental entity" that is able to complete the mission. Specifically, the craft will have to travel at least 500 meters on the Moon's surface before sending at least one gigabyte of images and videos back to researchers from the moon. All spacecraft must have high-definition video and still cameras equipped to meet minimum requirements. The first team to complete these tasks will receive the top prize of $20 million. "The Google Lunar X Prize calls on entrepreneurs, engineers and visionaries from around the world to return us to the lunar surface and explore this environment for the benefit of all humanity," said Peter Diamandis, chairman and CEO of the X Prize Foundation. “Having Google fund the purse and title the competition punctuates our desire for breakthrough approaches and global participation,” he added. All teams entering the contest face an expensive, daunting task. To accompany the construction of a spacecraft able to withstand the travel and photography portions of the contest, competitors must also pay to use or build a launch vehicle to get the craft to the moon. Once there, remotely controlling the spacecraft to take photographs and videos will also prove to be difficult. A $5M bonus will be offered to the company responsible for successfully landing on the moon and taking pictures. Google will offer a $5M final bonus to the team's rover that can successfully complete other missions while on the moon - furthest distance traveled, finding water or ice, best endurance to the cold lunar nights, etc. All interested parties have until 2012 to complete the required tasks to collect the prize. If all teams are unable to complete the task, Google will extend the deadline to 2014, but the prize purse will also drop $5 million. Google's official launch website can be accessed at GoogleLunarXprize.org. National space programs are beginning to put more research and development funds back into missions that involve the moon. The United States, China, Russia and India all have plans to either land on the moon or build a lunar base on the moon within the next 25 years. If you have opprtunity and money. "What can we say? Huh? But OLPC price is keeping more expensive. Even this PC is for world three, we also must know that the parts or component are not from world three. So we also can't angry to the maker or anything that:D, we should respect them because they fight for all obstacle on their way to make OLPC." Although its aim was to bring the price down, the organization behind the so-called "$100 laptop" is moving further away from its goal. The One Laptop Per Child Foundation said the device, now known as the XO Laptop, will now cost about $188. This is up $12 from the price tag the group gave in May of this year. Behind the price increase are rising costs of certain components and currency fluctuations, says OLPC, however they are committed to keeping it from rising any further. Reports say the OLPC has commitments for about three million devices, but the group will not confirm where the devices are going until production begins in October. While the device currently uses AMD chips to power it, Intel recently dropped its efforts to deride the project and said it was working with the group to put its chips in the second version of the XO Laptop, though no release date for that has been set. "Almost everyone in the world are using Mobile Phones. And there is a research before that saying mobile phones is causing brain cancer, because of the signal that said bad for our brain. Even research saying it doesn't causing brain cancer, we should know that we may not talking too long. But we can use earphone alternately, and I prefer to cable earphone not bluetooth earphone." Conclusions from a study conducted in the UK on the health impact of using mobile telephones were released today. The Mobile Telecommunications and Health Research Programme (MTHR) undertook the study as part of its 2007 report. The study concluded that there was no evidence linking short-term mobile phone use to brain cancer. Tests performed on volunteers in the study showed that brain function was not affected by mobile phone signals or signals used by emergency agencies. The MTHR says that the results are definitive enough that no further research is needed into this area. Part of the study included what is called the largest and most robust study of electrical hypersensitivity undertaken anywhere in the world. No evidence was found that any unpleasant symptoms experienced by sufferers are a result of exposure to mobile phone signals or from cellular towers. Further results in the study showed after investigation that mobile phones have no affect on cells other than heating them. Longer-term exposure to mobile phone signals still warrants more research in the opinion of the study because a limited number of study participants had used a mobile phone for more than 10 years. Further studies by the MTHR also confirmed that the use of mobile phones while driving using hands-free devices or simply holding the phone caused no more impairment on the part of the driver than any other in-car distractions. "Microsoft is just getting a bad luck. Since early September microsoft is just keep suffering." September hasn't been kind to Microsoft so far. In early September, the Redmond-based company settled its Iowa antitrust case and awarded Iowa consumers $180 million USD -- lawyers in the case received $75 million USD in legal fees. The same day, Microsoft dropped the price of its Zune from $249 to $199 in order to boost sales for the holiday season. The very next day, Apple dropped a totally revamped lineup of iPods on the market which overshadowed any buzz that Microsoft generated with the price drop. Apple burned Microsoft again with the announcement of the iTunes Wi-Fi Music Store which makes use of the WiFi feature built into the iPhone and iPod touch. Microsoft's Zune also features a built-in WiFi adapter, but has largely been rendered useless. Today, Microsoft got another dose of bad news. It was announced that California, Connecticut, Iowa, Kansas, Minnesota, Massachusetts and D.C. are asking a federal judge to extend their oversight into Microsoft business practices for another five years. An antitrust settlement reached in the fall of 2002 granted 17 states the ability to hold Microsoft accountable for its compliance with the court’s ruling -- that oversight will come to an end on November 12 if it is not renewed. "The principal constraint on Microsoft’s ability to abuse its market power will be gone," read a statement issued by the states citing what would happen if oversight powers are not reestablished in November. Judge Colleen Kollar-Kotelly noted that Microsoft is currently in compliance with the antitrust settlement, so that any request for an extension would have to show an "identifiable purpose." "We're a bit surprised that a few states are now requesting an extension," said Microsoft spokesman Jack Evans. Evan's comments were in response to the states' complaint that the antitrust settlement was ineffective. Microsoft's contention is that if the states feel that the antitrust settlement was ineffective, there should be no need to extend an "ineffective ruling." I just installed a little tool called Snap Shot to this blog that enhances link with visual previews of the destination sites. Example like to This Blog, when your pointer is over it, it will opt-out a mini preview of this blog. Also interactive excerpts of Wikipedia articles, MySpace profiles, IMDb profiles and Amazon products, display inline videos, RSS, MP3s, photos, stock charts and more. Enjoy this new feature and Keep Reading! "If you are a reader of DVD Forum, you should know that there is a new Triple Layer HD-DVD with 51GB for the capacity. But Toshiba say DVD Forum Hasn't approved that Triple Layer HD-DVD, just a preliminary version of Toshiba's 51 GB three-layer, single-sided HD DVD format had been approved by the DVD Forum. We can just hope that it's not gonna be expensive." In a statement to BetaNews this afternoon, a Toshiba spokesperson said that only a preliminary version of Toshiba's 51 GB three-layer, single-sided HD DVD format had been approved by the DVD Forum, caretaker of HD DVD. As it turned out, and as Toshiba's spokespersons may have only just now realized, the DVD Forum signed off on a preliminary specification, which may have been confused for the final specification because its version number is 1.9. "We understand that the preliminary version (1.9) of the physical specifications for the triple-layer 51 GB HD DVD-ROM disc has been approved," said Toshiba's spokesperson today. The spokesperson then added that it has not yet been determined whether current HD DVD players or recorders will be able to use the new format, which the headline of an official Toshiba statement given to BetaNews today is now calling "Trip-Layer." "Toshiba will study the performance of current HD DVD player/recorders with the disc after the standard receives final approval by the DVD Forum." That last part is a pretty clear indication that final approval was not granted, contrary to our earlier report based on industry news that cited sources with a stake in the format. The formal Toshiba statement reads as follows: "We welcome the DVD Forum Steering Committee's decision to approve the preliminary version (Version 1.9) of the physical specifications for the triple-layer 51 GB HD DVD-ROM disc. This decision reinforces the fact that HD DVD is capable of offering a range of capacities due to the flexible nature of the format and provides studios with even greater options for creating high definition content. With extended capacities, studios can meet their future needs for releases that may require more storage." Toshiba's admission today is the first genuine admission from the company that work on engineering the final "Trip-Layer" format has actually not been completed, as was previously believed. At the Custom Electronic Design & Installation Association (CEDIA), a trade show held in Denver Colorado, a new potential competitor to Blu-Ray and HD DVD was demonstrated. Instead of picking a side in the heated Blu-ray and HD DVD debate, New Medium Enterprises decided to go their own way, developing a new format called HD VMD. HD VMD stands for High Definition Versatile Multilayer Discs -- and here's the attractive part: it is far cheaper than either Blu-Ray or HD DVD, both for discs and for players. The key to HD VMD's low price is that it utilizes red laser technology, which is still vastly cheaper than the blue-violet lasers used in HD DVD and Blu-Ray players. Additionally, the format supports up to 7.1-channel Dolby Digital, Dolby Digital Plus, and DTS audio output, though it will not offer the high-bit-rate Dolby TrueHD or DTS Master Audio surround-sound codec. One feature that has not yet been discussed is whether the new device will support any sort of interactive code, such as HD DVD XML or Blu-ray's Java. Blu-ray was harshly criticized when releases failed to measure up to HD DVD in terms of interactivity. If HD VMD does not support a language to provide advanced user interaction, its future releases may face similar critique. While the HD VMD format is getting a late start in the competition, the format war remains undecided with the vast majority of consumers not having adopted either format, and still using DVDs. Current sales figures show discs Blu-Ray format disc sales total 1.6 million from January 1 through July 1, while HD DVD sales amounted to only 795,000, and only 3.7 million hi-definition discs have been sold in total. While both Blu-Ray and HD DVD camps try to use different portions of the sales numbers to indicate their dominance, the important thing to notice, is that these figures mean that only 1 in 100 Americans, approximately, have purchased any hi-definition content this year. With Blu-Ray and HD DVD's shallow market penetration, the new format has more of a fighting chance. HD VMD is debuting with a selection of 20 videos next month, including "We Were Soldiers" and "Apocalypto". The list has been criticized as not having many hot titles -- please refer to NDM's homepage for a full list. However, there are currently only 329 titles released on Blu-Ray (as of August 21st), and HD DVD has only 279 titles (as of September 4th), and these formats did not start with significant catalogs either. While the consumer market is very unpredictable, one thing that always drives sales is a low price. If HD VMD is able to build its catalog with significant movie releases, and is able to offer a price point as low as planned, it may be very competitive with HD DVD and Blu-Ray. Soon, Blu-Ray and HD DVD may have far more to worry about than each other. Last week, Dailytech reported that California's State senate had blocked employers from requiring their employees to get "chipped"--implanted with an RFID chip that would allow for radio identification and tracking. Now in addition to the privacy concerns, a new report by the Associate Press has brought to light serious doubts on RFID implants' medical safety. The report details how numerous studies on RFID implants in animal test subjects, starting in the mid-1990s, revealed that the implants led to a significant increase in malignant tumor growth. Keith Johnson, a retired toxological pathologist who led one of these studies, in 1996 at Dow Chemical Co., when interviewed in the report stated that he had no doubts about whether RFID was to blame for the increased incidence of cancer. He is quoted as clearly stating, "The transponders were the cause of the tumors." The findings were reviewed by top cancer specialists, who found the results disturbing. They cautioned people that these tests were performed on animals, so that they were not necessarily applicable in humans, however, most felt additional research was a necessity. Some went as far to say that they would not allow family members to receive implants. Currently about 2,000 people worldwide have received RFID chips implants, according to VeriChip, the leading manufacturer of FDA-approved RFID implants, including a couple who were ordered to do so by their employer. Verichip commented that they were "not aware of any studies that have resulted in malignant tumors in laboratory rats, mice and certainly not dogs or cats." The company also, sells RFID chips for animals. A significant detail to these studies is that many of them were not intended to study the correlation between RFID chip implanting to cancer--rather, during research on a separate topic the increased cancer rates were high enough to catch the researchers' attention and allow them to draw a clear conclusion that the chip was causing the increased cancer rate. The AP report goes on to discuss the suspect nature of the FDA's approval of VeriChip's human RFID implant. The FDA is overseen by the Department of Health and Human Sciences, which at the time of the approval, was headed by Tommy Thompson. Just two weeks after the Jan. 10, 2005 approval of the device, Tommy Thompson resigned his post with the department and within five months assumed a position at VeriChip. He received stock options and cash compensation for his newly acquired position. Thompson, until recently a candidate for the 2008 Republican presidential nomination, recently denied in an interview having any familiarity with VeriChip before his resignation. The FDA refused to comment on which studies it reviewed when approving the device. A recent AMA report which lauded RFID implants, claimed to be entirely unaware of the studies correlating the implant to cancer. Dr. Steven Stack, an AMA board member, said he had never heard the studies ever mentioned before. As Dr. Stack had knowledge of the Department of Health and Human Sciences committee's review of the implant, pending FDA approval, this statement would indicate that the Committee did not take these studies into account during its approval process. More research needs to be done before final conclusions are drawn, but as its dirty laundry comes to light, the controversial practice of RFID implanting and its FDA approval has received another major setback. Sony has unveiled a palm-sized digital audio player that combines the typical features of an MP3 player with robotic technologies to allow it to spin, flash lights and move forward and backward to the music. Called the Rolly, a combination of the words "rolling" and "friendly," Sony says it is meant to make listening and sharing music a more entertaining way. It includes 1GB of internal memory, measures 6.5 centimeters (2.5 inches) in diameter and weighs about 300 grams (10 ounces). The player includes onboard robotics software which analyzes the music and then causes its lights to switch on and off, or move its speaker covers to move the player back and forth. The user can also set the player to sit motionless if they so desire. About 4 hours of battery life are available if the user allows the Rolly to move to the music. Five hours of battery life are available if the device is motionless, Sony says. No buttons are found on the player save the on/off switch. Instead, the user twists one ring to move between tracks, and the other to adjust the volume. The Rolly can play MP3, Sony's ATRAC, or AAC files. In an innovative feature for MP3 players, the Rolly also includes Bluetooth capabilities, allowing it to receive and react to streamed music. Sony says the feature works with any device capable of Bluetooth streaming. How the player moves is up to the user. While from the factory a pre-set "dance" is available, customers with a PC can use the included Motion Editor software to create new moves for the Rolly. In addition, an online community will allow users to share their moves with others. Initially, the player will only be available in Japan starting September 29 at a price of 40,000 yen ($353 USD). Sony hopes to roll the device out elsewhere beginning next year, although no specific launch details have been released. Less than two years after it crossed the 100 million mark, total downloads of Mozilla's Firefox Web browser have now passed 400 million, although the number does not represent total installations. Since the release of Firefox 2 last October, the browser has continued to take market share from IE. Mozilla is now working on version 3 of Firefox, which is currently in its alpha stages of development. The update has seen a number of delays and a beta release is not due until the fall, but that hasn't slowed adoption. According to the company, Firefox usage in Slovenia is nearing 50 percent market share, which would put it over Internet Explorer for the first time anywhere in the world. Responding to a large amount of negative feedback from existing iPhone customers who felt slighted by Apple's decision to lower the price by a third to $399, CEO Steve Jobs apologized Thursday and said the company will offer a $100 credit for purchases from Apple's retail store or online store. In an open letter to customers, Jobs said it was the right decision to lower the price because "now it will be affordable by even more customers" in time for the holiday season, adding that in the world of technology there will also be an upcoming price cut or product update. However, he acknowledged that Apple should have done a better job taking care of early adopters. "Our early customers trusted us, and we must live up to that trust with our actions in moments like these," Jobs wrote. Details of the credit are still being worked out and will be announced on Apple's Web site next week. With a market likely a little more open to the need for online video in the living room than it was three years ago, Microsoft on Thursday reintroduced the Extender line, meant to complement households with Windows Media Center PCs. Microsoft first announced the Media Center Extender at CES 2004. However, the product line never took off as consumers balked at the need for another set-top box, and the user interface paled in comparison with the actual Media Centers. The Extender platform saw a rebirth upon the release of the Xbox 360 in November 2005, which included a version that replicated the PC Media Center experience quite well. In this iteration of the Extender, the devices will be produced by companies such as Linksys, D-Link, and Niveus Media. The new Extenders include high-definition, DivX, and Xvid support, and wireless networking capabilities. The devices come in a variety of form factors and various price points, and will be compatible with the Windows Vista Premium and Ultimate editions of Media Center. "With more than 60 million Windows Vista Media Center PCs in use worldwide, there are many customers eager to bring the simple and elegant Media Center experience to the televisions in their homes," Microsoft's eHome head Dave Alles said. The Extenders will be able to send protected HD content from CableCard tuners, Microsoft said, and will be compatible with several online music stores. Parental controls are also be built into the devices. Microsoft said that while it will only be working with the companies mentioned previously initially, it has plans to sign more partners as the market becomes established. It's has been long time since the las posting of troubleshooting. This is another one, the method to format a drive that the file system was changed to RAW. But before that, RAW is not a file system, RAW is really meaning like raw meat:D or ready to be changed or formated. So, RAW is not an error file system but a file system that need to be changed again. But sometimes our flash disk, hdd, and other storage types. It usually changed automaticly, because an unstable voltage, plugged out without "safely remove" for (flash disk and external hdd), and many mores. So, now you understand a little bit about RAW. 5.Right click at the DownRight side at the RAW file system drive. 7.Follow the wizard until the end. As expected, Microsoft on Wednesday released its Windows Live software suite, including the global betas of several of its desktop products. Among the applications included are Windows Live Photo Gallery, Mail, Messenger, Writer, OneCare Family Safety, and Toolbar. The unified installer for the product also acts as a central location to download updates to any program once it is installed. Evidence that Microsoft was preparing to make a major push with its Windows Live services first appeared on Tuesday, with the New York Times reporting that the unified application was close to reality. Microsoft had promised to make some major announcements surrounding its Live platform during the summer, however they never materialized. The Redmond company is still playing catchup to other Internet giants like Google and Yahoo, which so far have been the standard-bearers for the so-called Web 2.0 movement. "These applications bridge the gap between the Windows Vista PC and the Windows Live web services," Brandon LeBlanc wrote for the official Windows Vista blog. "Overall, the Windows Live suite is designed to extend your Windows experience by tapping into Windows Live. Of course choice comes with the Windows Live Suite as well." Windows Live Mail users can check any POP or IMAP account, LeBlanc added, along with using Windows Live Writer for a variety of blogging services. The release of the unified installer also marks the first time the Windows Live Photo Gallery application is made available to the public. Users can share pictures and videos on Spaces and Soapbox; and the application automatically arranges photos by events, much like the new version of Apple's iPhoto. Other features include automatic stitching of panoramic photos, improved photo editing tools, and the ability to view Quicktime files in the Gallery viewer. The Windows Live Mail beta builds on previous versions by adding new formatting abilities, and tweaks to performance. Performance is also improved in Messenger, along with family safety integration and security enhancements. Windows Live Writer is seeing the most changes, with an expansion to 32 languages, and 55 countries. The new version makes it easy to upload video from a host of video services into an entry, as well as new formatting options. Image upload to Blogger has also been added. "Together with our web services, we have a complete suite that combines the best of the Web and the best of Windows, and works the way you want," Windows Live Team vice president Chris Jones said in a Web log post. The unified installer is available for download from the Windows Live Web site. Wednesday marked the final 1.0 release of Microsoft's new Silverlight platform for building interactive Web experiences à la Flash, but the big news is that Redmond will extend official support to Novell's Linux port of Silverlight. Silverlight was first unveiled earlier this year, promising to make it easier for developers to build rich Web applications without delving into the complexities behind AJAX or suffering its limitations. This space is growing increasingly crowded with Adobe's new AIR runtime and Sun's JavaFX. Like Flash, Silverlight is a managed plug-in for distributing scalable graphics, that's also capable of delivering video. As you might expect, that video will utilize Microsoft's VC-1 codec, which has received much acclaim and which is among the standard codecs in both HD DVD's and Blu-ray's portfolios. Now that Microsoft has delivered version 1.0 of Silverlight, it is working hard to encourage its adoption by helping customers take advantage of the technology and establishing a partner program for third-parties to offer Silverlight-oriented services. CBS and Paramount have deployed a Silverlight experience on ETOnline for the Emmy Awards, with plans to do the same for the Golden Globes and Oscars. Home Shopping Network and WWE are also putting Silverlight on their Web sites. Break.com includes a special Silverlight-built search feature for video navigation, which Microsoft says "pushes the envelope for video on the Web." The final 1.0 build includes bug fixes and incorporates feedback from the Silverlight release candidate, but no new features, Microsoft Group Product Manager Parimal Deshpande told BetaNews. Microsoft itself is deploying Silverlight in a few areas, such as its Podium 2008 Web site for information on elections, and to stream Halo 3 videos. But Deshpande says Silverlight "is not just about the software, it's about the backend services." In turn, Microsoft will be providing free video hosting to Silverlight customers. The company also announced 35 partners to help with design, content deliver and more for providing Silverlight experiences on the Web. Touting its support for open source efforts, Microsoft is additionally working with Novell to bring Silverlight to Linux, after receiving numerous customer requests for such capability. Novell was already working on its own port of the software called Moonlight, and Microsoft now expects Novell to deliver a Linux version of Silverlight 6 months from today. Deshpande said no launch date has been set for Silverlight 1.1, but it expects Novell to ship a Linux version of that release 9 months after its debut. A September CTP of Silverlight 1.1 will be available for download soon. A service designed to help Windows users download Microsoft's updates and install them in a faster manner was ordered shut down by Microsoft, in a cease and desist letter to the service's proprietors. For the past few years the AutoPatcher service had been giving users what was believed to be a simpler and more intuitive front end and a monthly digest for downloading and installing updates. But it was redistributing Windows code - or, at the very least, distributing a new way to get to Windows code - and was an alternative to Microsoft Update, and as such, the company had no remaining patience for letting it stand. AutoPatcher's Antonis Kaladis posted the disappointing news on his company's front page this morning: "Today we received an e-mail from Microsoft, requesting the immediate take-down of the download page, which of course means that AutoPatcher is probably history. As much as we disagree, we can do very little, and although the download page is merely a collection of mirrors, we took the download page down." By early evening today, the entire company's Web site appeared to be offline. The Windows news site Neowin was a co-sponsor of AutoPatcher, and it too received a cease-and-desist notice from Microsoft. As the site's Steven Parker reported this morning, "I have no explanation for why Microsoft allowed it to continue unchecked for four years before making this decision." Though Neowin was also forced to remove the support forum it had been hosting for AutoPatcher, it received 171 comments by early evening today. Nearly all expressed regret at the decision, though some took Neowin to task for appearing to bend to Microsoft's will too early, and for not making a federal case out of this...quite literally. But there was also this: "All the kiddies need to stop complaining and start thinking about why Neowin did this. Microsoft lawyers have billions at their disposal. Neowin has ad revenue. Geez, I wonder who would win?" Sadly we must lose Autopatcher. But I never downloaded any update from Autopatcher before. I don't know if there is a service that very useful like this. But if it's back, I will download it. Performance, compatibility, and reliability have been among the biggest complaints of Windows Vista users, and the service pack will focus on those three major trouble areas. After dancing around the subject for months, Microsoft finally opened up Wednesday and said it will release the first Service Pack for Windows Vista in the first quarter of 2008 with a wider beta version coming in "a few weeks." The announcement confirms Microsoft comments in a Department of Justice filing in June that the company would have a test version of SP1 out before the end of the year. "We're feeling good about Windows Vista," said David Zipkin, a Microsoft senior product manager for Windows Client, in an interview. He pointed out that among other metrics, Windows Vista had 12 security issues in its first six months compared with Windows XP's 36 during its first six months. "At the same time, we are getting notes back that some people are having not so great experiences." Microsoft has seen a number of setbacks with Windows Vista thus far. Earlier this year, Dell decided that it would again sell Windows XP systems due to high customer demand and then announced it would be selling computers pre-installed with Linux. Many businesses, meanwhile, have opted to hold off on installing Vista indefinitely until Microsoft works out compatibility problems and other kinks. Last month, Microsoft CFO Chris Liddell changed an earlier prediction for an 85% to 15% split between sales of Vista and XP in 2008 to a 78% to 22% split. Performance, compatibility, and reliability have been among the biggest complaints of Windows Vista users. Many of the Windows Update fixes for Vista to date have addressed problems related to these three major trouble areas. Microsoft appears to have listened, focusing most of Vista SP1 on under-the-cover features. As is typical for Windows service packs, many of the patches, fixes, and updates thus far released through Windows Update will be included in SP1, as well as some other fixes and adds. However, Vista SP1 will not include new drivers, as they would weigh down the service pack because they are computer-specific. Those will continue being released by the driver vendor or via Windows Update. One of the main goals of SP1 will be to improve performance. Among the performance enhancements will be a package released Tuesday via Windows Update that fixes problems related to poor memory management, long calculation times for estimating the time it will take to move or copy files, screen saver memory leaks, and delays returning from hibernation or stand-by mode. Vista SP1 will also include some tweaks to make Internet Explorer 7 speedier. Other focuses for Vista SP1 will be reliability and administration. Several recent patches issued on Windows Update, including one Tuesday, have addressed reliability concerns. In the administrative arena, BitLocker Drive Encryption will now support encryption of any drive volume, rather than just the Vista drive. Vista SP1 also will make it easier to connect and print to a local printer within Terminal Server sessions, add network diagnostics for file sharing problems, provide more options for Windows' disk defragmenter, and include the a remote access VPN tunneling protocol called the Secure Sockets Tunnel Protocol. There will be some minor feature upgrades in Vista SP1, the most significant of which will be an ability for users to choose which program they want to handle desktop search by default, rather than making Microsoft's own search capabilities the only default. Google complaints brought on the announcement of those changes earlier this year. Other changes include a new encryption generator, improved security algorithms, support for the ExFAT file format used in new consumer devices, better performance for SD Card data transfer, and common security APIs for security partners. Users might think of service packs as heavy fixes because of the massive overhaul of the operating system in Windows XP SP2, but Vista SP1 will not include any major user interface changes. That means no new version of Windows Media Center, for example. "This is not a feature delivery vehicle," Zipkin said. "It's not about breaking applications." The download for Vista SP1 will be smaller than that of XP SP2, weighing in at about 50 Mbytes to XP SP2's 120 Mbytes. Vista SP1 also will be available through Windows Server Update Services, as a standalone one-gigabyte software package (larger because it includes full software components instead of only incrementally changed file portions), and through computer manufacturers once the final version is released. Zipkin said Microsoft delayed discussion of Vista SP1 this long because it needed to find a balance between giving customers the right amount of time to react to the announcement and Microsoft the right amount of time to formulate and test the updates. Also on Wednesday, Microsoft announced that Windows XP SP3 will be available in the first half of next year. Microsoft standard practice is to issue a service pack that includes all recent hot fixes and patches as a product reaches the end of its career. The only new feature in XP SP3 will be support for Network Access Protection, a security mechanism included in Windows Server 2008 and in Vista. Microsoft began testing early pre-beta versions of Vista SP1 and XP SP3 earlier this month with approximately 100 testers, but copies of both quickly began appearing online to the chagrin of Zipkin. Some fixes in the leaks will not appear in the final versions of the updates. "I think it's unfortunate that they were leaked," he said. "At this point in the game, that kind of information can give misdirection and misinformation to our customers." Now that Microsoft has set a release date for both the beta and final versions of Windows Vista Service Pack 1, the company is also offering a detailed look at what's being fixed and changed. One thing customers will not see is major changes to User Account Control, although Microsoft says it will reduce some pop-ups. Perhaps the most notable change will not be for customers, but rather Microsoft partners. The company is including an API that third-party developers can tap into in order to work with kernel patch protection on x64 editions of Vista. This patch protection has proven to be a problem to antivirus and other security vendors. Microsoft has classified the updates in Vista SP1 into three categories: quality improvements, including reliability, security and performance; improvements to the administration experience, including BitLocker; and support for emerging technologies and standards like EFI and exFAT. Provides security software vendors a more secure way to communicate with Windows Security Center. Includes application programming interfaces (APIs) by which third-party security and malicious software detection applications can work with kernel patch protection on x64 versions of Windows Vista. These APIs help ISVs develop software that extends the functionality of the Windows kernel on x64 computers without disabling or weakening the protection offered by kernel patch protection. Adds an Elliptical Curve Cryptography (ECC) pseudo-random number generator (PRNG) to the list of available PRNGs in Windows Vista. Enhances BitLocker Drive Encryption (BDE) to offer an additional multifactor authentication method that combines a key protected by the Trusted Platform Module (TPM) with a Startup key stored on a USB storage device and a user-generated personal identification number (PIN). Improved reliability and compatibility of Windows Vista when used with newer graphics cards in several specific scenarios and configurations. Improved Windows Vista reliability in networking configuration scenarios. Improved reliability of systems that were upgraded from Windows XP to Windows Vista. Increased reliability and performance of Windows Vista when entering sleep and resuming from sleep. Improves the speed of copying and extracting files. Improves the time to become active from Hibernate and Resume modes. Improves the performance of domain-joined PCs when operating off the domain; in the current release version of Windows Vista, users would experience long delays when opening the File dialog box. Improves battery life by reducing CPU utilization by not redrawing the screen as frequently, on certain computers. Improves the logon experience by removing the occasional 10-second delay between pressing CTRL-ALT-DEL and the password prompt displaying. Addresses an issue in the current version of Windows Vista that makes browsing network file shares consume significant bandwidth and not perform as fast as expected. BitLocker Drive Encryption encrypts extra local volumes. For example, instead of encrypting only drive C, customers can also encrypt drive D, E, and so on. Addresses problems with printing to local printers from a Windows Terminal Services session. The Network Diagnostics tool will help customers solve the most common file sharing problems, in addition to the basic problems that it already diagnoses. Administrators can control the volumes on which to run Disk Defragmenter. The service pack will uninstall the Group Policy Management Console (GPMC) and GPEdit.msc will edit local Group Policy by default. In the SP1 timeframe, administrators can download an out-of-band release that will give them the ability to add comments to Group Policy Objects (GPOs) or individual settings and search for specific settings. In the future, flash memory storage and consumer devices will use the exFAT file system. Windows Vista SP1 adds support for this file system to Windows Vista. The service pack will include support for Secure Digital (SD) Advanced Direct Memory Access (DMA), which will be on compliant SD host controllers soon, to improve transfer performance and decrease CPU utilization. x64 PCs can boot using the EFI. Windows Vista currently supports network boot by using Windows Deployment Services for x86, a PC's basic input/output system (BIOS) for x64 PCs, and EFI for IA-64 PCs. Windows Vista SP1 will add support for network boot by using x64 EFI. The service pack will add support for Direct3D 10.1, adding application programming interfaces (APIs) and features that enable 3-D applications, so game developers can better take advantage of a new generation of Direct3D graphics hardware. The Secure Socket Tunneling Protocol (SSTP) is a remote access tunneling protocol that will be part of the Routing and Remote Access Service (RRAS) platform. This protocol helps provide full-network virtual private network (VPN) remote access connections without challenges that other protocols face when traversing NATs, Web proxies, and firewalls. Windows Vista SP1 will include support for SSTP. Probably in response to a few users' bewilderment over the seemingly unrestricted accessibility of what had actually been one of Windows Vista's most requested new security tools, Group Policy Management Console, Microsoft announced today that the act of installing Vista Service Pack 1 will simply delete the tool altogether. "Administrators requested features in Group Policy that simplify policy management," reads a white paper released by Microsoft this afternoon. "To do this, the service pack will uninstall the Group Policy Management Console (GPMC) and GPEdit.msc will edit local Group Policy by default." Last November, I chronicled the addition of GPMC to Vista in a Reference Guide page for InformIT. There, in reference to Microsoft having not yet edited its own documentation from the XP era, I made a comment that I will now have to edit for a future revision: "GPMC is definitely on your Vista machine; you don't have to download it." Although the white paper did not say so explicitly, GPMC will probably continue to be available for free download from Microsoft, and that will likely remain true when GPMC is revised. (The new version of GPMC is being tested now along with Beta 3 of Windows Server 2008.) UPDATE: WS2K8's release was delayed until the first quarter of next year, Microsoft announced this morning. But as we learned all through the testing period for Monad - later "Microsoft Command Shell," later PowerShell - whether a component is shipped with the operating system or instead made freely available "offline" makes all the difference with respect to what a consultant is required to know in order to receive certification. It also impacts the extent to which published documentation, both by Microsoft and others, includes references to a topic. Throughout the XP era, many Professional Edition users were wondering when group policies would be added to the basic operating system, only to be astonished to learn from the Internet someplace that they were already there to begin with. As independent developer Derek Melber wrote for Redmond Channel Partner magazine back when Vista was released last January, Microsoft's choice to include GPMC in the shipping versions of Vista was supposed to have been a dream come true for admins, especially those who had to put up with "offline" availability only. "Most of you reading this article likely use the GPMC every day when you work with GPOs," Melber wrote. "However, there are plenty of administrators that have been reluctant to embrace the GPMC. Many complaints surrounding the GPMC stem from it not being included with the operating system. Consequently, many have the mindset that it must not be important or reliable. But because the GPMC actually is one of the most important tools you need to administer your GPOs, Microsoft decided to put it in every installation of Vista. The company also plans to put it in Longhorn Server when that product becomes available." Since Vista's release, there have reportedly been some complaints about Microsoft having included something as powerful as GPMC in relatively full reach of the everyday user, who could conceivably learn how to override policies set by the admin. There were, however, obvious solutions to that problem, one of which included using GPMC to create a default GPO that prohibits GPMC's use by non-authorized accounts. Another involves serious account policing, and a third compels admins to actually pay attention to their logs, where an override of a GPO would undoubtedly be recorded in detail. Inevitably, there may come complaints from others who will fault GPMC's absence from Vista SP1 as being partly responsible for some security vulnerabilities, as its presence may be key to patching some obvious holes. Security engineer Jesper Johansson wrote about one such GPMC use last September, specifically with regard to an acknowledged vulnerability that enabled Windows Shell to execute non-authorized code remotely. Johansson advised that users and admins could stop the problem immediately, in advance of a patch from Microsoft, by using GPMC to change the permissions for ActiveX controls so that they could not execute certain code remotely. GPMC's removal from Vista will not mean group policies will not run there, only that they're expected to be administered from Windows Server. But today, Microsoft's stance on the removal is that you asked for it. "The goal of Windows Vista SP1 is to address key feedback Microsoft has received from its customers without regressing application compatibility," its white paper reads. "Windows Vista SP1 will deliver improvements and enhancements to existing features that significantly impact customers, but it does not deliver substantial new operating system features." In fact, it will certainly deliver at least one less feature than it did before. A curious network performance reduction noticed by many Windows Vista users of the 2CPU forum that became the talk of Slashdot last week has been identified as having been caused not by DRM, as Slashdot users expected, but by a curious prioritization "feature" of Vista that's intentionally biased toward Media Player at the expense of network and system resources. The effects of this feature were first revealed last June, as BetaNews reported, by Microsoft security engineer Mark Russinovich. In a blog post to SysInternals this afternoon, Russinovich once again provides a clear view of what some prominent bloggers have called a bug, but which Microsoft maintains is an intentional choice: favoring multimedia playback when the CPU is stressed, even if it means slowing down file and network transfers and even the mouse pointer. The culprit, Russinovich writes, is the Multimedia Class Scheduler Service (MMCSS), one of the many services run within Vista's service host. When the CPU is under stress, Windows Media Player 11 places a call to MMCSS, which in turn boosts the player's own priority relative to other processes. Many Vista users found out about this through the use of Vista's Performance Monitor. "When a multimedia application begins playback, the multimedia APIs it uses call the MMCSS service to boost the priority of the playback thread into the realtime range, which covers priorities 16-31, for up to 8 ms of every 10 ms interval of the time, depending on how much CPU the playback thread requires. Because other threads run at priorities in the dynamic priority range below 15, even very CPU intensive applications won't interfere with the playback." At least, that's the intention. Internet traffic shouldn't be affected by this performance throttling, he continues, due to multiple connections that fragment Internet traffic even in the best conditions anyway. Conceivably, the lesser the bandwidth, the fewer the fragments. 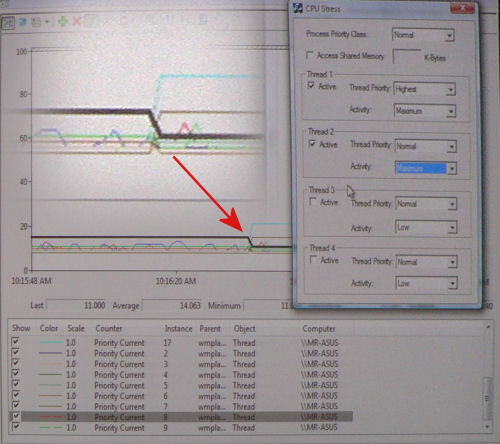 From Mark Russinovich's demonstration at TechEd 2007 last June, this histogram from Vista's Process Explorer clearly shows the task priority for Windows Media Player 11 (the cyan-colored line) boost dramatically when his stress test is applied to the CPU. But the amount of throttling Microsoft engineers intentionally chose to employ was based on their assessment of 100 Mbps networks, where fragmentation is great enough that packet receive rates are high. "The hard-coded limit was short-sighted with respect to today's systems that have faster CPUs, multiple cores and Gigabit networks," Russinovich went on, "and in addition to fixing the bug that affects throttling on multi-adapter systems, the networking team is actively working with the MMCSS team on a fix that allows for not so dramatically penalizing network traffic, while still delivering a glitch-resistant experience." That's where Mark leaves us hanging for now. He did use the word "bug" to describe the behavior of this choice on multi-adaptor systems, and he did characterize Microsoft's forthcoming solution as a "fix." That flies in the face of an official Microsoft response to ZDNet blogger Adrian Kingsley-Hughes, who had written earlier that he was going to turn most Vista sounds off until Microsoft worked out a solution. "Please note that some of what we are seeing is expected behavior," the spokesperson told Kingsley-Hughes, "and some of it is not. In certain circumstances, Windows Vista will trade off network performance in order to improve multimedia playback." Then reviving an old Microsoft phrase that was so often used in the 1990s to officially explain away behavior that couldn't otherwise be explained, Microsoft wrote, "This is by design." Another citation from Microsoft's response says users typically hate having to hear sputters and clicks from their speakers when their network or CPU is stressed, and it's that hatred which provoked the company to make the trade-off in the first place. Russinovich's characterization of the throttling trigger as "hard-coded" may be an indication that the company's fix may involve giving the user a choice of which services should be pared down when crunch time comes, system services or multimedia. But with the sheer number of system services Vista now runs, crunch time may be coming too often anyway. It's no secret that Microsoft employs individuals that attempt to bypass the security restrictions built into its software products in order to make them safer, but the company has rarely publicized this fact. That's changing with a new Web log called hackers @ microsoft. The Redmond company plans to utilize the blog to introduce its "white hat hackers" and show people what they do for Microsoft, although in keeping with tradition, those mentioned on the blog will likely go by their pseudonyms. "At his or her core, a true hacker is someone who is curious and wants to learn how systems work. This can and of course at Microsoft is done in an ethical, legal manner," techjunkie writes in the first posting on the site.